During the day, these 14 furniture and home decor items like lounge chairs, sideboards, bathroom countertops, tiles and wallpaper look fairly ordinary (though beautifully designed). 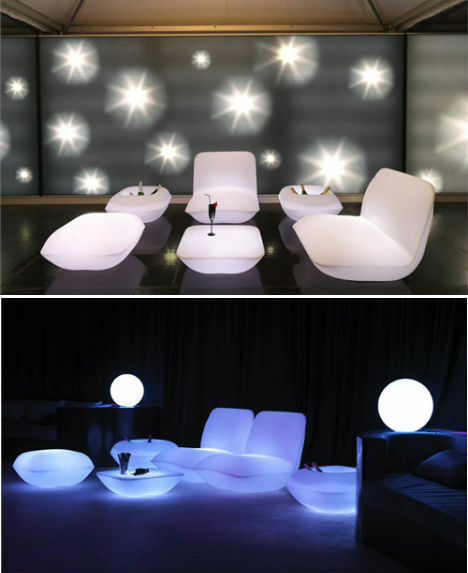 But when the lights go out, they reveal their versatility, lighting up with built-in LED lights or glowing from within. 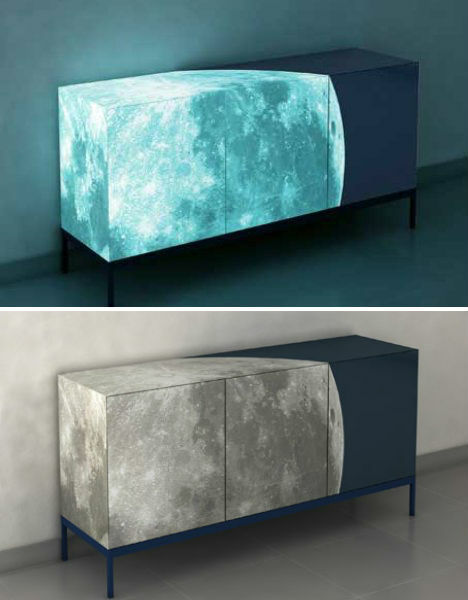 Not only does this gorgeous sideboard feature a stunning digital image of the moon over three-quarters of its surfaces, but it was also treated with glow-in-the-dark paint and ecologically friendly dark blue paint to create a heavenly effect at night. The sideboard was designed by Sotirios Papadopaulos for ENNEZERO and displayed in Milan in 2008. 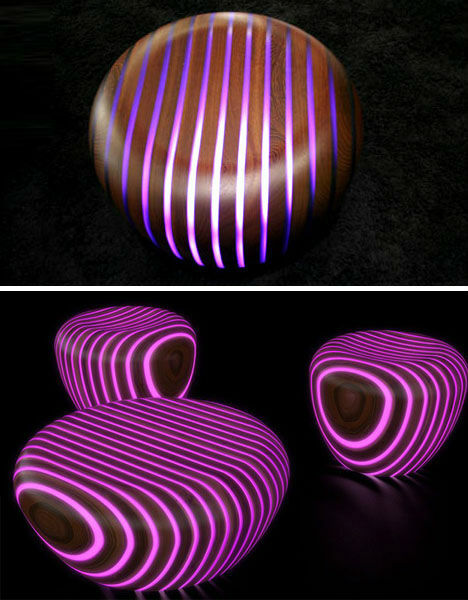 Rounded wooden furniture that can act as ottomans, stools or coffee tables, ‘Bright Woods‘ from Gruppo Avanzini includes stripes of various types of wood in between glow-in-the-dark resin. 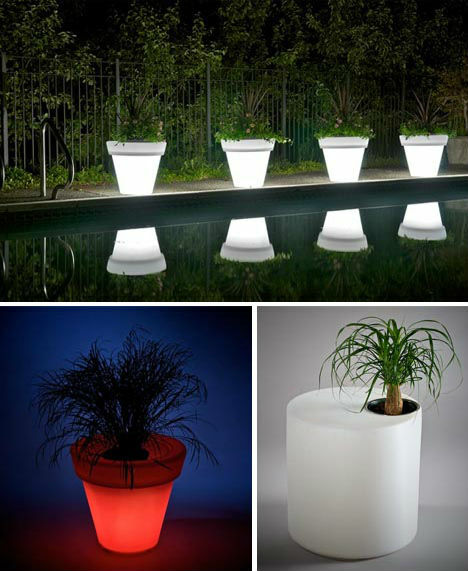 Why install extra lighting in your garden when your potted plants could glow? These pot lights from Rotoluxe come in various shapes and sizes including printed varieties, and include lighting elements that shine from within their transparent bodies. 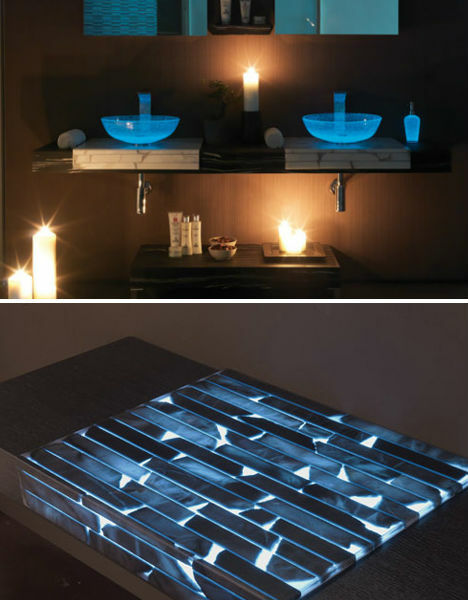 The soft illumination given off by these glowing countertops makes night lights in the bathroom a thing of the past. Italian company Masto Fiore hand-crafts these beautiful countertops from natural alabaster stone with integrated illumination. 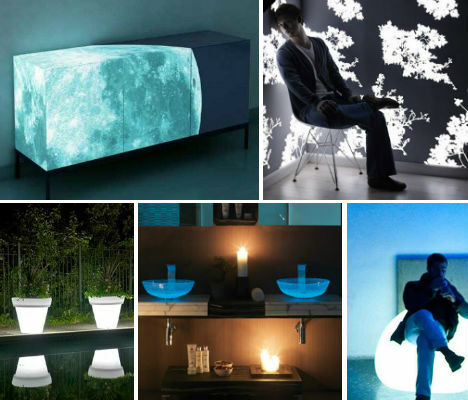 Pair them with translucent glass sink vessels and you’ve got quite a magical effect. 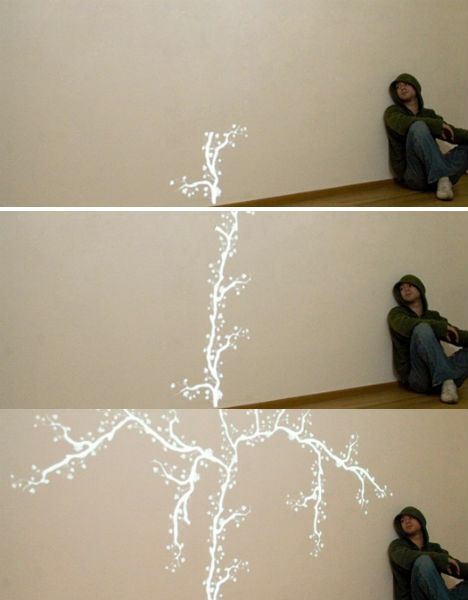 It’s wallpaper that lights up! 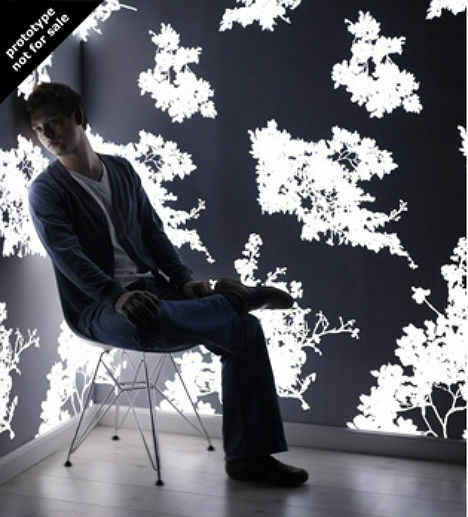 Designed by Jonas Samson, this light-emitting wallpaper is unfortunately just a prototype and not for sale, but it’s an intriguing concept. 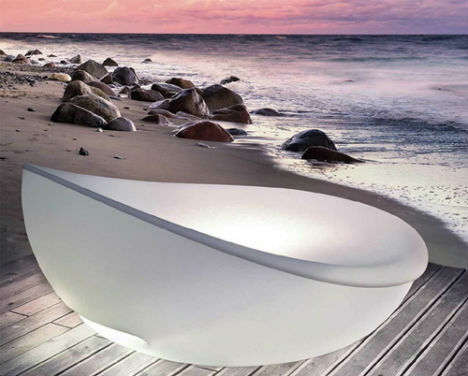 By day, the Lagoon daybed by Solpuri is a comfortable and very chic place to relax, accommodating two and offering a removable shade. 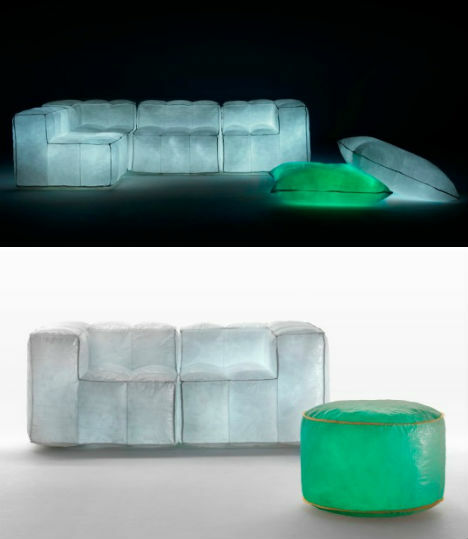 By night, the translucent base of the lounger lights up from inside. 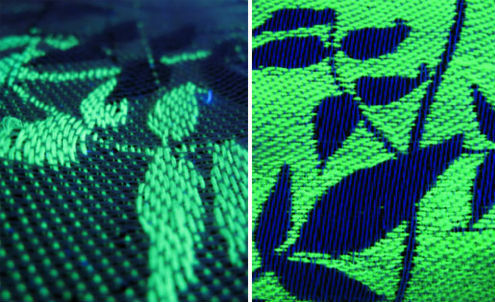 Designer Kathy Schicker calls our attention to something we never realized that we needed: glow-in-the-dark textiles. Offering a range of prints, Schicker’s collection looks like ordinary fabric during the day but starts to glow when the lights go out. 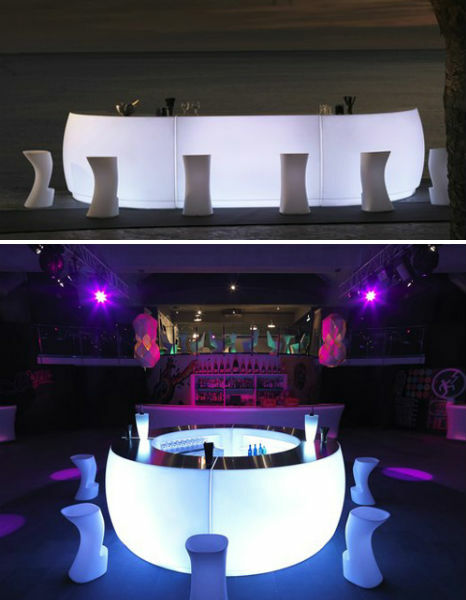 Furniture maker Vondom offers up yet another futuristic glow-in-the-dark offering in the form of a lighted outdoor bar. The Fiesta bar comes in curved and straight sections so you can adjust it to the size and shape you want, and is fitted with LED lights in your choice of colors. The unusual rounded shapes of this garden collection by Plust are enough to make it stand out, living up to its name ‘Gumball’ with candy-bright colors. But what sets this collection apart even more is – you guessed it – the capability to glow in the dark. 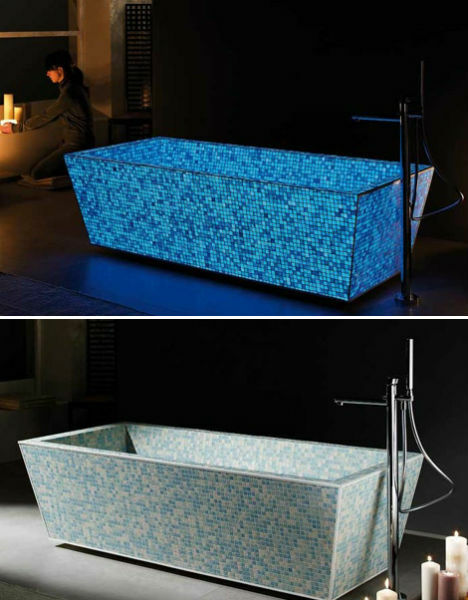 An Italian company specializing in photoluminescence has produced these incredible glowing tiles, which can be used to create a bathtub as pictured, an artistic mosaic or even to cover entire surfaces like floors and wall tiles. When the lights go out, the photoluminescence materials glow in a range of colors. Who doesn’t love a good dual-purpose piece of furniture? 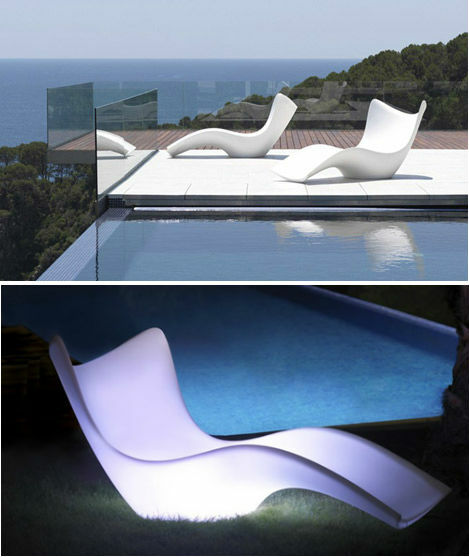 Vondom offers another modern outdoor lounge chair that is beautiful enough during the day, but turns into a lantern of sorts when the sun sets. The materials used to make it are 100% recyclable, and they can withstand extreme weather conditions, making it a durable and eco-friendly choice. Patio furniture doesn’t get much more inviting – in a space-age sort of way – than this. 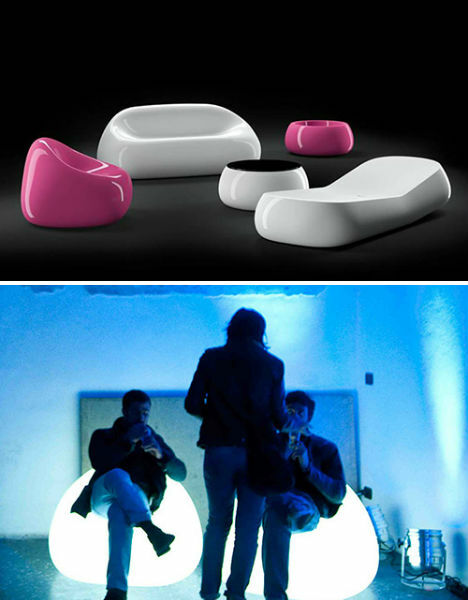 Shaped like comfy pillows, this collection designed by Stefano Giovannoni for Vondom is made of the same material as the lantern/lounge chair and comes in a range of shapes including bucket-like side tables that make perfect coolers. Throw them in the pool, toss them on the lawn or just position them through your house. 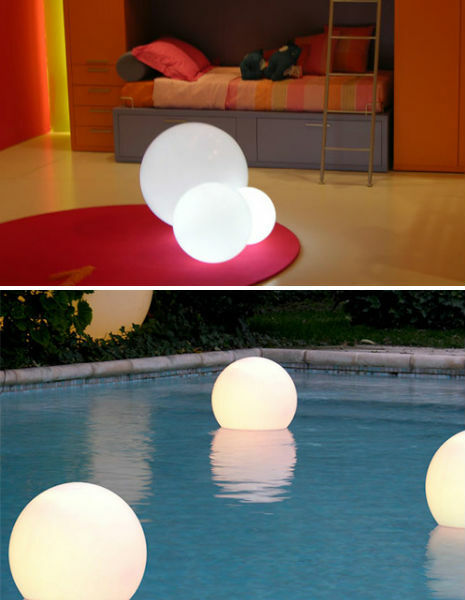 The Aqua Globo by Slide Design looks equally cool indoors and out, providing visual interest and a soft glow.